Controlled using a Basic Stamp 2SX microcontroller. 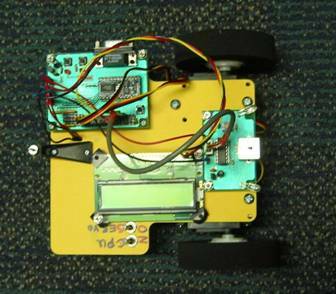 Infrared sensors at the front detect obstacles, and an lcd display shows the status of the robot. To drive the wheels, standard rc servos were taken apart and modified to allow continuous rotation. 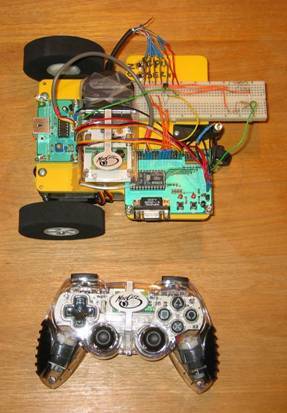 A wireless Playstation 2 controller was interfaced with the carpet rover microcontroller to have the ability to remotely control the rover. The PS2 controller also has many extra buttons to allow more sophisticated control. The goal is to control the robots actions, and at the same time use its onboard sensors to prevent it from colliding with obstacles.